In the upper left, a white field with the Ceiba Macho of the Parque Principal, representing wisdom, protection, shelter and fertility. In the upper right, seven stripes of green and white, a geometric circular figure white centered representing the sun, synonymous with life, heat, force, and a ray crossed by the circle, representing the energy that is generated by the municipality for the country. The bottom part has a red triangle, sitting on its base, synonymous with solidity, firmness, decision, perfection, and on it the initial letters of the municipality (S.A.T.) in white. The shield is ornamented in gold to represent the wealth of the municipality. Flag - Consists of three colors: green, red and white. On the left is a red triangle, representing the municipal head, synonymous with life, force, dynamics, movement; its left to right direction indicates progress, advance and decision. The second element is a white stripe that represents Inspecciones de Policia, Santandercito and Pradilla (this last one shared with the Municipality of the College, again synonymous with peace and tranquillity. Finally, fourteen horizontal strips, alternating green and white, are a way of representing the agricultural calling and the unshakeable peaceful condition of the settlers of the territory. 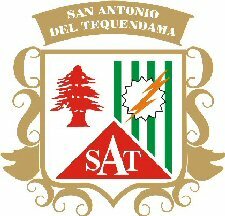 Flag of San Antonio del Tequendama in 1993 (probably). It appears in the book "Directorio de Despachos Públicos de Colombia 1993".